Today a BDEMU Switcher for MAC OS X has been made readily available thanks to developer Marcocanc. Check out the statement and the download link below. Hi folks, today I'm releasing a tool which I wrote a long time ago. 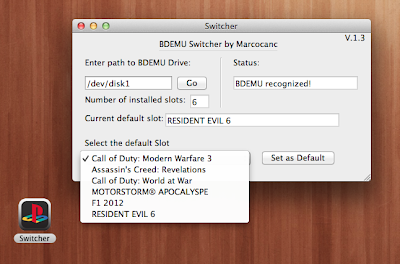 This tool allows you change the default slot of a BDEMU drive on Mac OS X. Unfortunately, as OS X 10.8 doesn't allow raw HDD access to normal users anymore, you'll have to launch it as root if you're a 10.8 user (a tool that makes this very easy is available for free HERE). OS X versions below 10.8 aren't affected by this problem. The names of the games will only show up in the drop-down menu if they were set as "memorandum" during the slot-creation process (or manually using a hex editor). In case the names weren't set, the game-ID is going to be displayed instead. To connect to the HDD, you have to look up its name in the Disk Utility (e.g. if the disk is called disk3, the path is going to be /dev/disk3). For any questions or problem reports, leave a comment below or tweet me Marcocanc. Thanks to RichDevX for helping me code this application!